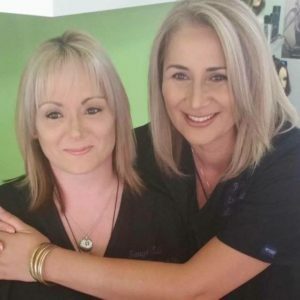 Tiffany and Rosalie have passionately been helping clients regain their confidence through providing a personalised hair loss solution, for over 20 years each. They take great pride in offering all clients in Brisbane and the Gold Coast a natural, drug free, but most importantly an affordable hair loss solution. Tiffany and Rosalie are committed to continually expanding their natural hair loss treatment knowledge allowing them to offer you the latest and proven solutions that will always bring a smile to your face, because you look great. Hello, I’m Tiffany Skarott and 20 years ago, just out of a hairdressing apprenticeship, I got into hair replacement in a Cairns hair loss treatment centre. It was there I developed a real love for helping people who suffered from no self-esteem because of their hair loss. And when my efforts started putting smiles back on troubled faces, I knew this was to be my life’s work. 15 years ago, I moved to Brisbane and immediately threw myself into all the hair loss treatment research and learning I could find. It was during this time my dream of having my own hair loss clinic in Brisbane started to occupy my thoughts. Then, in 2014, I finally bought Tango Hair and started creating a real home full of natural hair loss treatments for Brisbane locals. Then joined by another hair loss specialist, Rosalie, the Tango Team became complete. As a wig specialist, Rosalie’s true passion is cutting and styling an individual look. With 25 years’ experience under her belt, and a true desire to complete our client’s hair loss transformation, the real work began. And there’s hardly a day that doesn’t go by when we don’t feel immense satisfaction and pride in helping troubled people overcome hair loss problems. We just want to keep expanding our hair loss treatment knowledge and open our Brisbane doors to those folks who genuinely want to look their best as they find their lost confidence. Copyright © 2019 Tango Hair Loss Clinic. All rights reserved.